Scribie is a transcription company that hires freelancers to transcribe audio files. This type of work is very popular which is why I’m covering it, but I want to state right of the bat that the pay is not the best. Scribie might be a good fit for you if you’re looking to make some money in your spare time (although there are many ways to earn more than this.) However, this job will not provide you a liveable wage. One of the pros of Scribie is that they offer a work when you want type of model so you aren’t set to any type of schedule. As you accumulate earnings you can request a Paypal payment at any time. 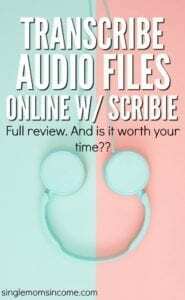 Scribie offers general transcription work. You simply listen to audio files and then type them out. After completing and submitting your work, it will be reviewed. Once it’s accepted, payment will be credited to your Scribie account immediately, the same day. A distraction-free zone to work. This is for your benefit so that you can focus on your work and work faster, allowing you to earn more. A verified PayPal account that is linked to your bank account or credit card so that you can get paid. Headphone or headset to listen while blocking out any background noise.The latest version of Firefox, Chrome, or Safari web browser. The application process is pretty simple, just provide some basic information and wait to hear from them. If your application is accepted, you’ll be invited to take a transcription test before you’re hired. If your application is rejected, you can simply delete it and apply again. Once your transcription test is reviewed you will either be hired or rejected. If you are rejected at this stage, you are allowed to review your test and reapply. Even if you don’t make it the first time around, you’ll have plenty of opportunities to reapply. Jobs are paid by audio hour, not the amount of time it takes you to transcribe it. The pay is between $5 and $25 per audio hour based on the job itself. You will have the opportunity to select the jobs you want and avoid the ones you don’t. At this rate, a 6-minute file will pay between $0.5 to $2.00, but it may take you up to 45 minutes to transcribe it depending on your typing speed. You will also be paid a $5 monthly bonus for every 3 hours of completed work each month. If you complete 6 audio hours, you’ll receive a $10 bonus. All audio files are 6 minutes or shorter so you can easily do one or two a day and earn a few extra bucks daily plus a nice monthly bonus. To learn more and apply, visit the Scribie website and submit your application. You’ll be provided with an application number that you can then enter on their website to track the status. Again, I don’t think this is a great way to earn. If you just want to test it out to see if you like general transcription then it might be worth a shot. However, there are ways to earn a much higher amount per hour from home. 11 High Paying Work from Home Jobs without a Degree – If you think that not having a degree is holding you back, you’re wrong. These 11 jobs all pay $36,000 per year or more and do not require a degree. 17 Work at Home Jobs with No Start-Up Fees – If you’re worried about getting scammed you’ll love these jobs that require zero start-up fees. 10 Ways to Earn $1,000 per Month from Home – 10 different ideas with hourly wages listed. I am a freelance writer and a blogger who talks about various work at home options. In my research, you can also check out Rev and Tigerfish if you are starting out. Wow! It is such a great post. Who would have thought that you could get paid for transcribing audio files? Thanks for the idea. People looking for earning some extra money will find this very helpful, because I did. Although, it may not be the biggest earner for you, you could some extra bucks by working from home.